On several occasions I have declared my absolute love of pecan pie, especially my Aunt Brenda's. And in my brazen youth, I have crowned myself as an ice cream expert, and though I am older, wiser, and not as brash these days, I still think I know what I'm talking about...sorta, at least, anyways. 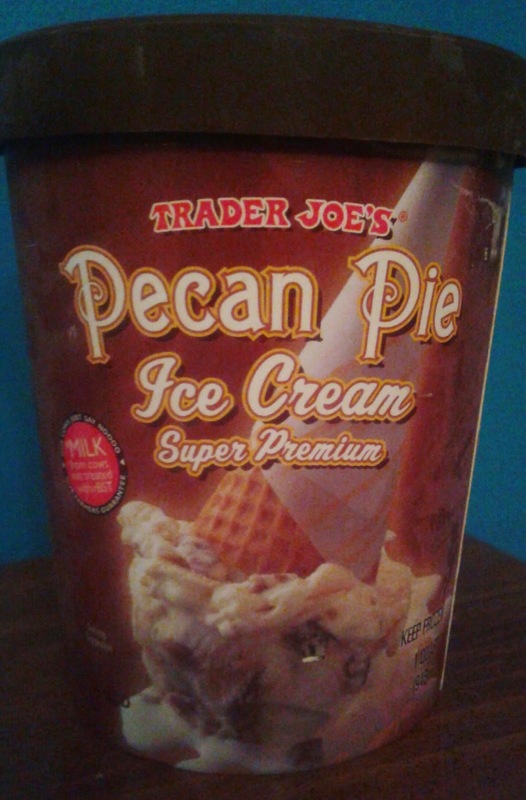 So a) why was it such a surprise to see a bucket of Trader Joe's Pecan Pie Ice Cream nestled in the freezer? 2) Why have I never tried this? and d) Why, so soon after throwing me a bone, does TJ's have to do THIS to me in the midst of my diet? Arrrrrrrrgh. Once spotted, there was no question that this quart of potential frozen yummy nirvana was coming home. I locked eyes with Sandy and put up the requisite hesitancy, might have even lightly stomped my foot some in some oddball show of supposed defiance, but no, really, this was going to my freezer and to my belly no matter what. 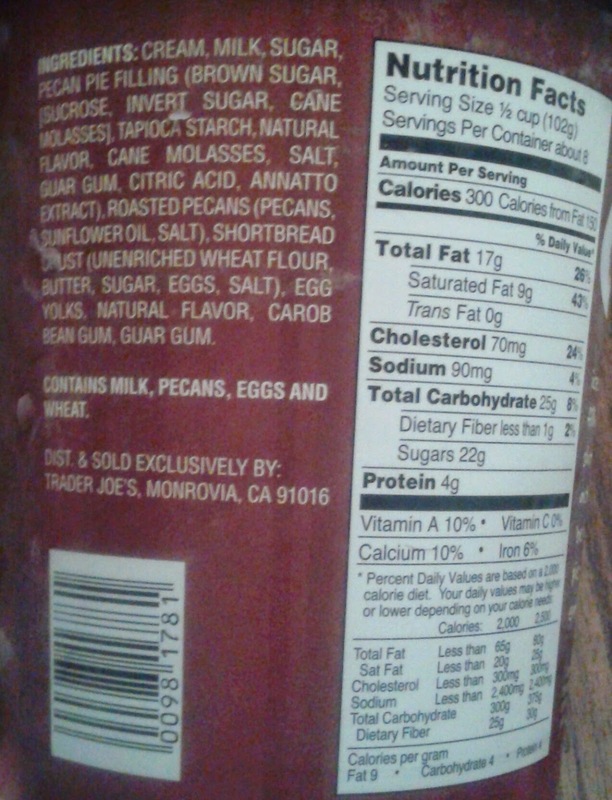 It's pretty decent stuff. Take your not-so-basic French vanilla ice cream (TJ's is spectacular! ), add in some big swirls of pecan pie filling in all its brown-sugary / molassesy magic, and a couple pecans and a small handful of shortbread pie crust crumbles, and there you go. Tasty combo? No doubt. But notice the problem? While the pie filling portions are tasty and appropriately plentiful (so much better than the caramel ice cream reviewed way back in the day), there's just not enough nuts and pie crust for my liking. Realistically, to me, there's about half of what there should be. Digging through a particularly rich filling vein the other night, there were only three, maybe four partial pecans and no discernible crusties. Obviously, nuts are kinda pricey and all, but a few more would really be killer - the ones in there maintained their nutty texture extremely well, offering a great crumbly crunch amidst all the creaminess. It's all possible that with the rest of the ice cream being so rich, with shortbread such a comparatively muted flavor, that only the bigger bits were noticed - in that case, make 'em bigger, TJ's! All that being said, after it being in the house for a couple nights, with some great restraint there's at least half of the quart left in the freezer, and gosh darn it, I'd love to house every last little bit of right now, then blame its disappearance on the teenage exchange student living with us, who mysteriously drank all of our coffee cream the other day. Apparently I now have this thing called "willpower." Hrmmm. Amazing. For the wifey's take, she's kinda opposite of me: she thinks there's an acceptable amount of pecans while not enough crust, while I'm vice versa. Maybe we mined the wrong scoops and shoulda switched bowls, I don't know. We both agree that, potential blasphemy aside, the pecan pie ice cream is so much better than any pumpkin ice cream TJ's can offer, except those delicious little cookie sandwiches. Overall, for $4.49, we're fairly happy.